Published on December 20, 2012,	in Fresh Goods. We finally got em. 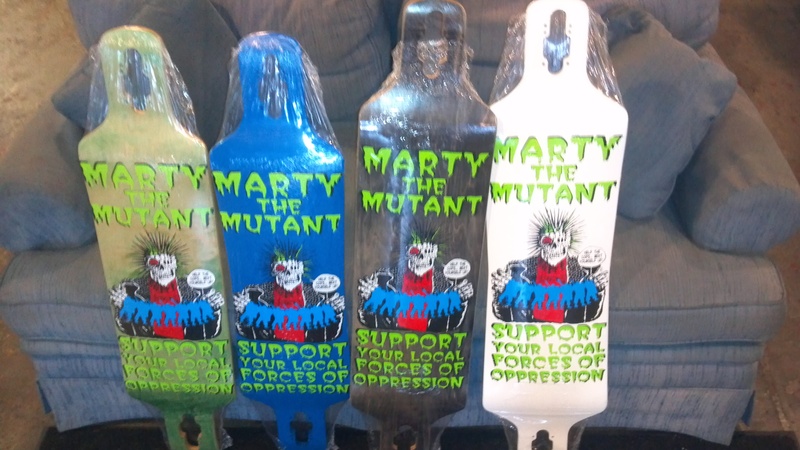 New “Marty The Mutant” longboard line for a sweet price for a performance longboard deck. 1/2″ of drop, sym shaped, twin kick, drop through goodness. Sharp edges and pockets to lock you in when you’re doin what you’re doin. These are also our first longboard suitable and stiff enough for downhill speedboarding. So we got two different lengths, and two shapes in each length. The first being the 40″ “Forty Ouncer”. The first shape is a Tapered 10″ wide, the second being a 9.5″ straight shape. Both having slight kicks, twin shape, and a 31.5″ wheelbase. The second being the 38″ “38 speshul”. 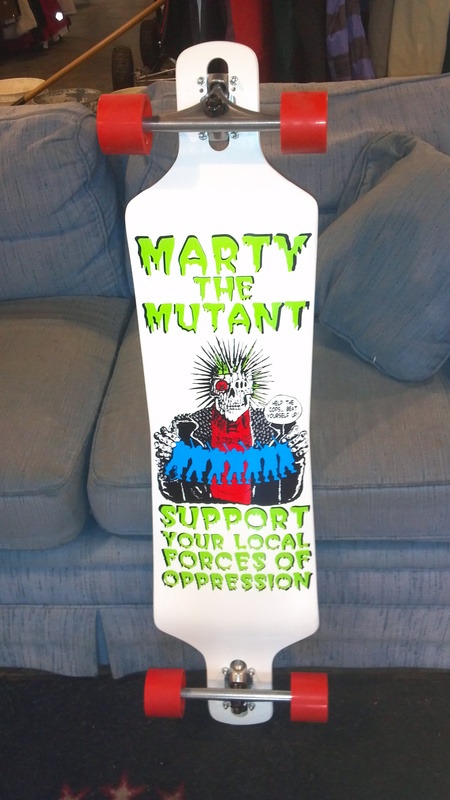 The first shape is a tapered 9.5″ wide, the second being a 9″ straight shape. Both having bigger kicks, twin shape, and a 28.5″ wheelbase. We got em in tons of different flavors as well. Some dipped full color, and some stained. At 62 buckaroos, you can’t go wrong. Published on October 10, 2012,	in Fresh Goods. New Sector 9 for you campus pushers and gravity freaks. We got new cruiser completes ready to go, as well as new Downhill Division racing shapes. We are also stocked up on Sector 9 Driver Slide Gloves, Sector 9 Butterballs in 70mm and 65mm, and Sector 9 Race Formulas. We also got some sweet new shirts, snapback hats, flexfit hats, and cool bags from Sector 9 you will have to come in check out yourself. Published on September 18, 2012,	in Fresh Goods. 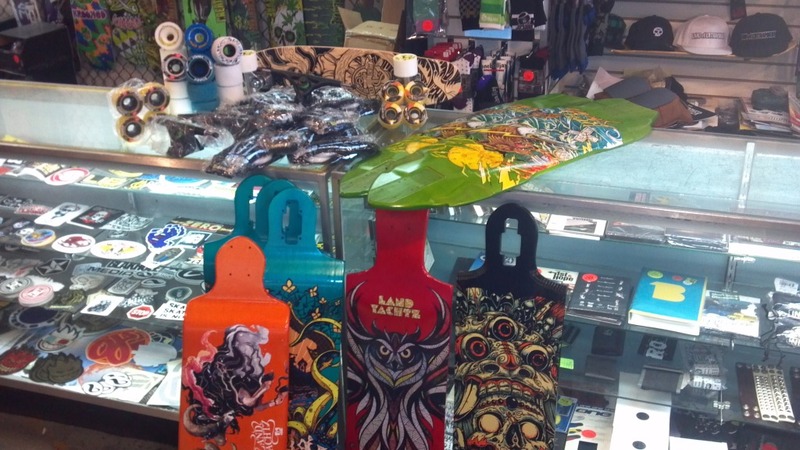 Whole bunch of Landyachtz longboards in to resolve the need for all of ya. From the double drop Switchblade, to the rippin’ little mini-cruiser Dingy. All in and ready to go. We also, are stocked up on everything else from other brands. 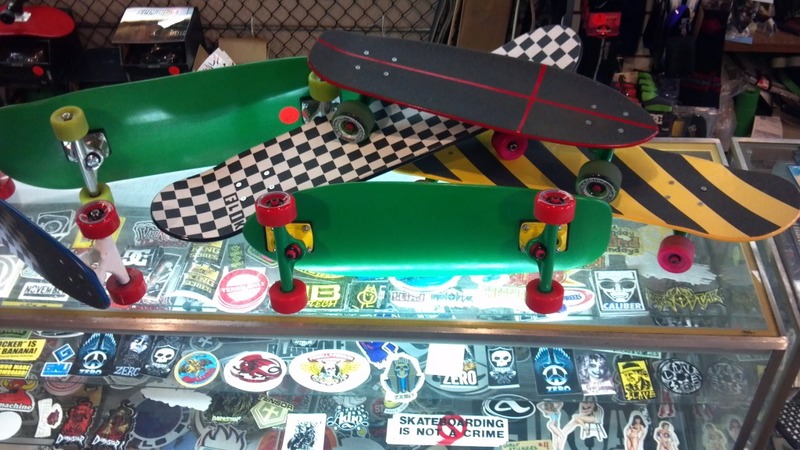 Retro Style Skateboards And Mini Cruisers In! Published on August 18, 2012,	in Fresh Goods. Just in time for back to school, we got new retro skateboard shapes and mini cruisers you can fit anywhere. The retro mini fits in a locker and looks as cool as a cucumber. And it’s made of wood. Not the cheap plastic crap that they stopped making skateboards with. The retro skateboard is fitted with some softer wheels and turn-alicious trucks to make gettin’ around nice and easy. These things are also sweet for some ditch slashing. Get a pinche retro setup before they are gone cabrone! Published on August 9, 2012,	in Fresh Goods. 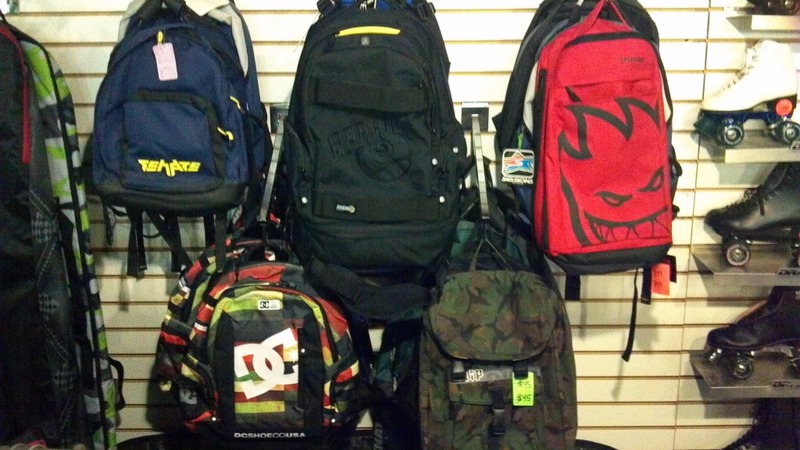 We got a whole bunch of stuff in including backpacks for back to school. Not to mention we got some new shoes on the clearance rack and new shirts to boot. A whole bunch of new skate stock in including Anti-Hero, Toy Machine, Venture, Thunder, Spitfire, Bones, and much much more. 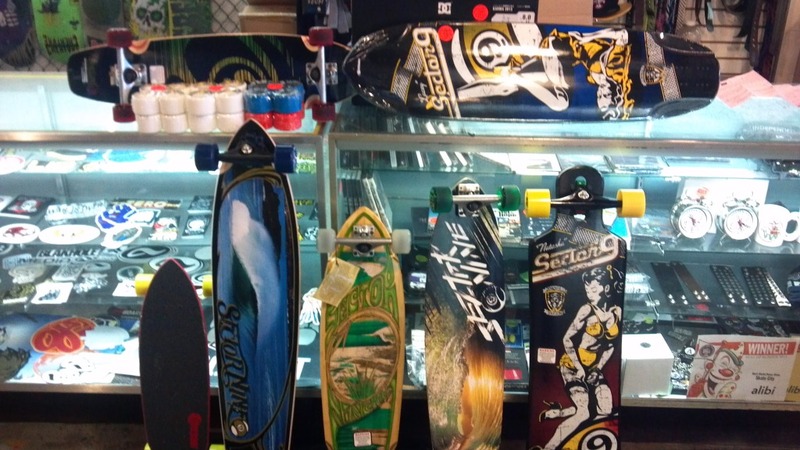 We also got new Longboards and accessories such as Loaded Longboards, Orangatang Wheels, Landyachtz, Sector 9, Hawgz Wheels, Caliber Trucks, Volante Wheels, Bear Trucks, Venom Bushings, Vicious Grip Tape, and Caliber Trucks! Come and get some sick new stuff so you are ready for school!